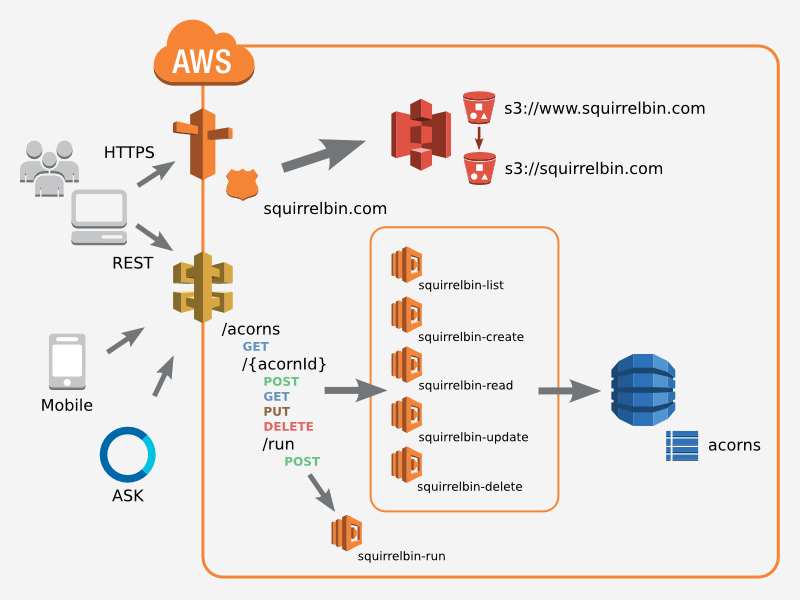 Let me introduce you to SquirrelBin, a serverless microservice based web application built with Angular, APIGateway, Route53, CloudFront, Lambda, and DynamoDB, S3 Static web hosting, all of which (excluding Angular) are serverless offerings from Amazon Web Services (AWS). This application does not even have any code running on the server! Wait a minute, “How can that be you say?”, well because of the feature rich offering from AWS Lambda, one can map API endpoints to Lambda functions that are just instances of the new microservice-http-endpoint blueprint which are pre-configured to hook directly into DynamoDB by default. Click here to see the SquirrelBin site in action.